Renewed concerns about trade tensions with China and slowing global growth sent markets down Thursday and Friday. A deadline looming next Friday for Congress and the White House to reach a spending agreement and forestall another government shutdown will likely contribute to market-watchers’ anxieties the nearer it draws. 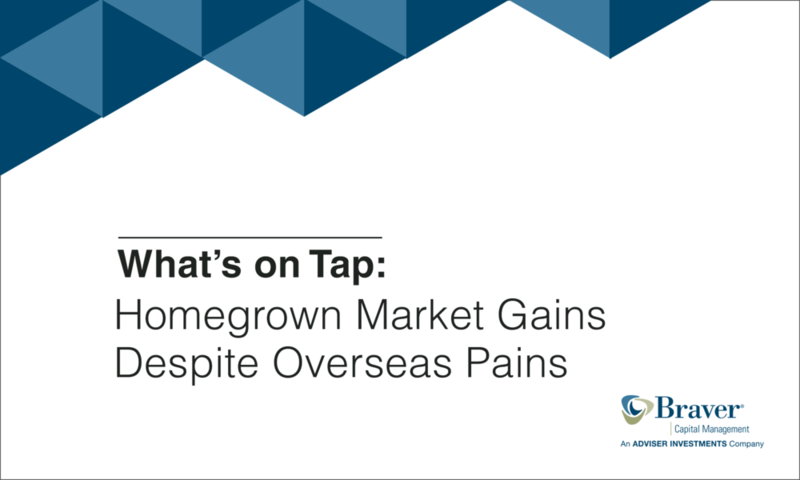 On the other hand, fourth-quarter earnings reports reflected themes we’ve been covering week-to-week: A U.S. consumer in fine fettle and slowing economic growth overseas. Service-oriented companies continue to expand at a healthy clip. By any measure, the labor market is strong and stable. For the year through Thursday, the Dow Jones Industrial Average and S&P 500 have each returned 8.1%. The MSCI EAFE index, a measure of developed international stock markets, is up 6.1%. As of Thursday, the yield on the Bloomberg Barclays U.S. Aggregate Bond index has dipped to 3.17% from 3.28% at 2018’s end. On a total return basis, the U.S. bond market has gained 1.1% for the year. Fourth-quarter earnings reporting season rolls along, and so far the companies in the S&P 500 are set to post their fifth straight quarter of double-digit gains, growing at an average rate of 12.4%. These impressive results played no small part in the markets’ outsized January performance. But earnings could pose a challenge to the stock markets in the months ahead. As is typical each year, analysts have been lowering their estimates for the first quarter that ends in March. But the consensus this year is that earnings may be slightly lower this quarter than they were a year ago. That’d be the first year-over-year drop since the second quarter of 2016. One quarter of earnings declines is hardly the end of the world. Since expectations have come down significantly in recent months, it won’t take much for investors and traders to be pleasantly surprised. And an earnings contraction on its own isn’t a signal that a recession is around the corner in the U.S.; slower earnings growth might reflect more trouble in Europe and China than it does in our own economy. The market could easily power through a single quarter of contracting earnings—for example, the S&P 500 gained 2.5% in the second quarter of 2016. Still, our outlook coming into the year was built in part on the view that earnings would continue to grow in 2019, so we’ll be watching the trends closely. We don’t know how long the current relative calm in the markets will last, but it marks a fine occasion to review your overall financial picture with your Adviser Investments team. This is the time to do it, instead of during the more emotionally trying moments when markets are tumbling from their highs, as they were in December. Today, stocks have bounced back and made up the ground they temporarily gave up in 2018. A good long-term investment plan should be built to withstand (and take advantage of) the inevitable, but momentary, market dips that are part and parcel of being an investor. But if the fourth-quarter’s turbulence tested your tolerance for risk, today’s calmer markets are a chance to consider repositioning your stock exposure to a more comfortable level. It’s impossible to predict whether stocks will rally from here or if we will revisit December’s lows. What we do know is that it’s easier to make sound investment decisions during periods of lower volatility than when prices are falling and anxiety is pervasive. When unexpected storm clouds roll in to your life, you don’t want to be caught without an umbrella. Insurance plays a critical role in protecting you from getting drenched, and for a truly robust wealth plan, it’s important to have more than bare minimum coverage. That’s why we recommend a discussion of how to extend insurance beyond traditional packages with all financial planning clients. A personal umbrella insurance policy, one that kicks in after the liability limits of your auto and homeowners policies are exhausted, can protect against potentially devastating liability claims. How does it work? Let’s say you’re at fault in a car accident and the cost of injuries to others is $600,000. Your auto insurance policy has a bodily injury limit that tops out at $300,000—absent umbrella coverage, you’re on the hook for the next $300,000. With a sufficient umbrella policy, you would have insurance coverage for those additional damages. The rule of thumb when buying an umbrella insurance policy is that it should roughly mirror your liquid net worth. Are you unsure of your net worth? Start by listing your assets: Bank accounts, investments and home equity. Then add up liabilities: Mortgage, car and student loans, plus credit card balances. Subtract those liabilities from your assets and presto! That’s net worth. Next week, we’ll be looking closely at data on job openings, small business optimism, inflation, household credit and a read on December retail sales figures that was delayed by the partial government shutdown. Please note: This update was prepared on Friday, February 8, 2019, prior to the market’s close. Past performance is not an indication of future returns. The tax information contained herein is general in nature, is provided for informational purposes only, and should not be construed as legal or tax advice. We do not provide insurance, legal or tax advice. Always consult an insurance professional, attorney or tax professional regarding your specific insurance, legal or tax situation.